Invasion! Victory? Wait, I'm confused. 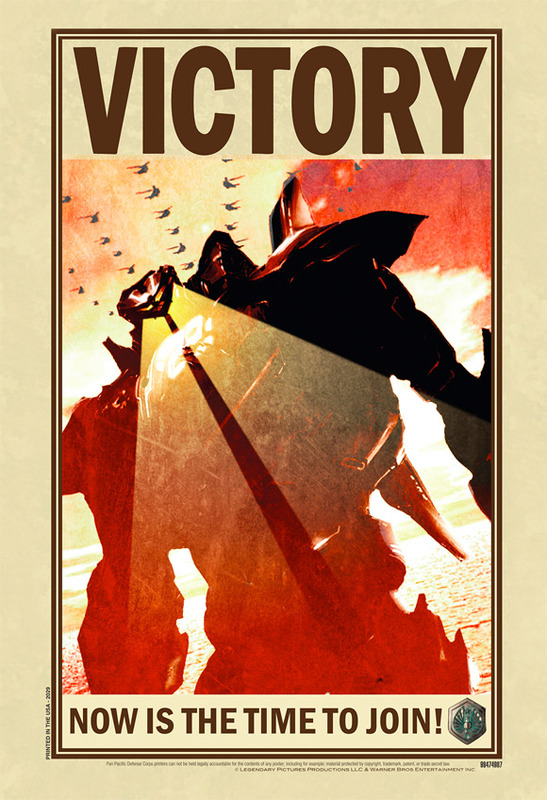 Are they saying we have achieved victory? Or that, if you sign-up to fight, we will achieve victory (one day)? Nerdist has debuted a brand new New York Comic-Con exclusive poster for Guillermo del Toro's epic new sci-fi movie Pacific Rim. Yes, it's about giant robots (that two humans control) in the future battling giant alien creatures that have invaded our oceans. It looks awesome, but Guillermo said no trailers will publicly debut until December. The poster is a piece of propaganda art by Spanish artist Raúl Monge, who did concept art for the movie, showing one of the big Jaegers robots in it. It sounds like there might be a surprise at NYCC, but Guillermo said we won't see much else until December. Guillermo del Toro (Hellboy, Pan's Labyrinth) is directing Pacific Rim from a script by Travis Beacham. The film follows a washed up former pilot (Charlie Hunnam) and an untested trainee (Rinko Kikuchi), who are teamed to drive a legendary but seemingly obsolete Jaeger, a massive robot designed to fight legions of monstrous creatures known as Kaiju, which started rising from the sea years ago. They stand as mankind's last hope against the mounting apocalypse. The film also stars Idris Elba, Ron Perlman, Charlie Day and Clifton Collins Jr. and Warner Bros. sends the film to theaters everywhere on July 12th, 2013. Excited? Yep, Victory is obviously the 'goal' here. This movie is going to be something really special and fresh. Kind of like, " We beat'em, now let's send back to that hell they call 'Home'."